we can offer an excellent solution. Les Carroz is a pretty little French alpine mountain village, 40 minutes from Geneva on the road to Chamonix. It is ideal for family summer holidays, and if you are looking for activity holidays it is perfect for all ages. There is always masses going on in the village from free concerts from great bands to fetes and events. It has a welcoming and friendly atmosphere. 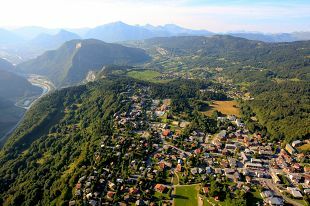 Over recent years it has evolved from a small Savoyard hamlet to a year-round resort, with particular emphasis on the needs and wants of children, but without losing its character and warmth. However it’s not just for kids: for grown-ups there are many bars, excellent restaurants, plus a good range of shops and even a night-club! Accommodation is in our traditional Alpine chalet, sleeping up to 5 families in 5 family suites. The chalet is situated a short 5 minute walk from the town centre convenient for all local amenities and activities. In summer we still offer half board accommodation with free child places, but we can also offer self catered and bed and breakfast options as well. With our flexible pricing, free children’s places and the huge range of activities available, we can offer superb activity holiday deals. We offer in-house childcare as in winter for when you may want to spread your wings a little with your older children and leave your younger ones in our care. For more information, see the summer prices page. If you are looking for a family summer holiday in France or a family activity holiday or specifically a vacation with kids holiday activities with a little bit more, 360 Sun and Ski is the perfect choice for your summer holiday, France.